The problem with drawing topical cartoons is it draws you into public debates about matters you know very little about (apart from the current angle the media is chasing). 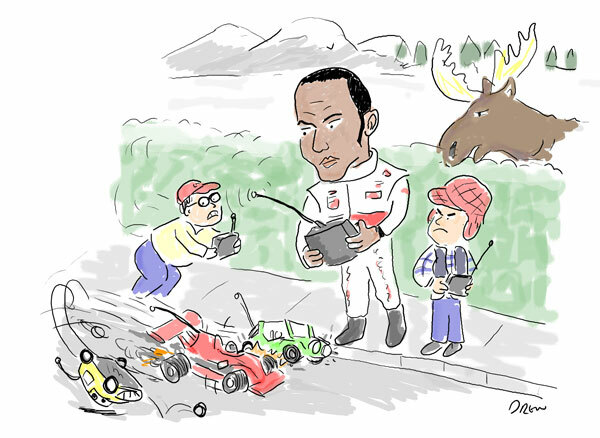 Take this example from the CCGB compedition which is on the theme of 'Remote Control' where I have taken the criticism from the Canadian Grand Prix around Lewis Hamilton's reckless driving and used it to try and be funny. I haven't watched F1 for a while mainly because it is long and in my opinion mostly dull (although many will disagree). In my mind Lewis Hamilton driving a bit aggressively and causing a few crashes is not a bad thing from the point of view of entertainment unless someone gets hurt. Anyway by tomorrow it won't matter as I'll be taking a different news story and trying to get an angle on that.